EZ UnEXIF : Protect your privacy! Prevent possible identity theft! Easily remove EXIF information from your photos. Did you know that your camera or phone puts personal information such as camera/phone brand, camera/phone type (and in some cases, phone carrier/network), GPS coordinates/location in which the photo was taken (if you allow your camera to record such information), focal length (can be used by intelligence agencies or identity thieves to calculate distance between camera and object in focus), whether flash was used, and even more to every photo you take? Most phones and cameras do this. Most users don’t know. These information are called EXIF (which stands for Exchangeable Image File Format) information, and usually are attached automatically to photos. If you share an EXIF-containing photo to anyone, they can easily view its information. 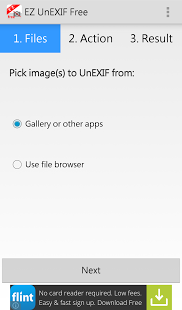 EZ UnEXIF Free is a easy but powerful privacy tool that lets you remove such EXIF information. Use it before you share your photos to Facebook, Twitter, WhatsApp, or other social networking site to protect your privacy. This EZ tool is literally easy & simple to use, as easy as 1-2-3 – the name isn’t merely a pun! 3. EZ UnEXIF Free will do the rest for you! Then you are free to share your EXIF-free photos without compromising your privacy. If you have any question or run into any trouble, please contact us at support@cakecodes.com and we will help you.